Wisconsin Post Office Handbook, revised edition No. 3, Frank Moertl. 1999 states the Pine Bluff Post Office opened in 1846 with George P. Thompson as postmaster where he had a store in SE4 of Section 33 (map below) about one mile north of what is now Klevenville. It closed in 1855 to reopen with Kenneth Cameron as postmaster in 1856. Again it closed in 1863 to reopen with Matthew Anderson (section 27 just east of the now Pine Bluff) as postmaster in 1864. It closed for good in 1903. In the 1861 plat map the Pine Bluff Post Office is shown on Lucinda Lemon's property in SE4NE4 of section 26. (bottom right map). By 1873 (top map) the post office was in the H. Winkle's (as "Winkel" on 1861 plat) store near the Pine Bluff Creamery. On the 1873 plat map Klevenville, in Springdale Township, is erroneously (?) named "Pine Bluff" with the correctly named Bluff Post Office. It is hard to know if the "George P. Thompson" post office is the same as "Bluff" in 1882 or if it became the "Pine Bluff" post office in what is now known as Pine Bluff in Cross Plains Township. 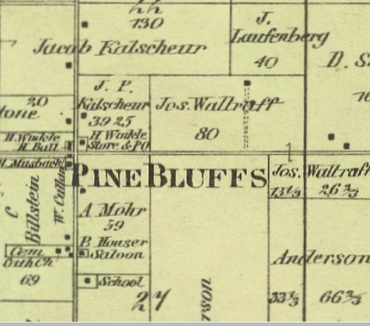 The Wisconsin Blue Book shows Pine Bluff with a post office from 1853 to at least 1935. (See chart on Post Office page).